Qatar 1966, FDC Michel 94-101, the low values 1np to 4np with the very scarce red overprint, the high values 5np to 1r with black overprint. 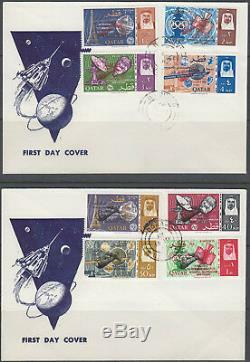 The item "1966 Qatar FDC Mi. 94/101, Space Weltraum Gemini, red/black ovpt. Bl0245" is in sale since Monday, September 11, 2017. This item is in the category "Briefmarken\Mittlerer Osten\Katar". The seller is "golfstaaten-philatelie" and is located in Veitshöchheim. This item can be shipped worldwide.